Jurassic World Evolution will launch with around 40 different species of dinosaur. New information about the game was revealed by German magazine PC Games. Here’s five things we’d like to see in Jurassic World Evolution. The article (which you can read an unofficial translation of here) states that there will be around 40 dinosaur species available when the game is released, although it’s reasonably likely that that number will increase over time with the introduction of various DLCs. 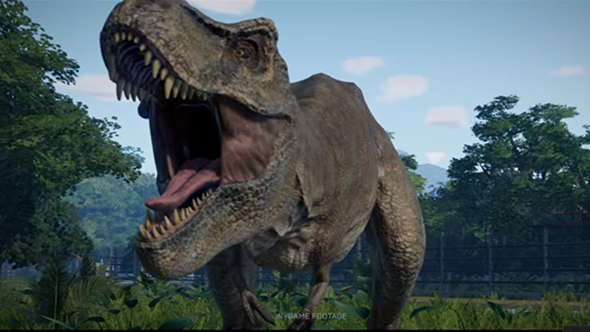 For now, we know that the Tyrannosaurus, Triceratops, Velociraptor and Stegosaurus are all among the species confirmed to be in the game on launch, with a handful of others also confirmed, or likely to appear. All those dinos need somewhere to live, so it’s handy that the game seems to have five separate islands to house them. All five of the islands from the Jurassic Park movies’ Muertes Archipelago will feature in the game, and lead designer Andrew Flethcher says each of them will have their “own special features,” based on their size and climate. Jurassic World Evolution is scheduled to release on June 12, but it won’t feature mod support when it does. It’ll have Jeff Goldblum though, which might be better.